Only the location was good - no lift, 4 flights of stairs and they will not keep your luggage past check out time. Everything pretty much, e.g. the perfect location for shopping and easy walking distance to all the landmarks, the sheer size of the rooms, and an washing machine!!! Cozy small apartment with everything you need for a holiday. The apartment is ideal for 2-3 people.Great location for sightseeing, shopping. There is a supermarket nearby. Quiet street. Very spacious. Great location. Restaurants and good shopping very close by, quiet street. roomy, spacious, amazing location. Valentina was very helpful. 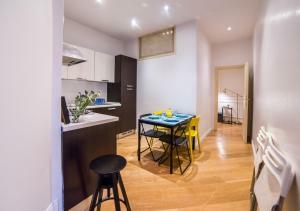 The location is absolutely great, near to the via de corsa and via condotti. The apartment is rather spacious and the hosts are good. Great location!! 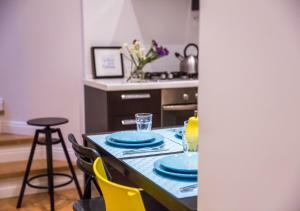 Walking distance to all Rome attractions, and on the hurt of the shopping area. In addition, great hosts! sweet Marco welcome us at the apartment, and gave us detailed explanation of the apartment and the area. The apartment was very spacious and great for big groups or families. Generally, it was great value for money. Marco, who met us at the property, was fantastic. He made contact a few days before we arrived and kept in touch in order to organise when to meet. Upon meeting at property he explained everything, made the process quick and easy so we could get on with our trip. The location of property was fantastic. We always stay in Spagna area when we go to Rome as it's super convenient and metro is there. Back to the apartment, it was clean and freshly decorated. Simple style, not cramped with furniture or useless items. We were a family of 6 (3 couples) and there was so much space! Loved it. Would stay again. 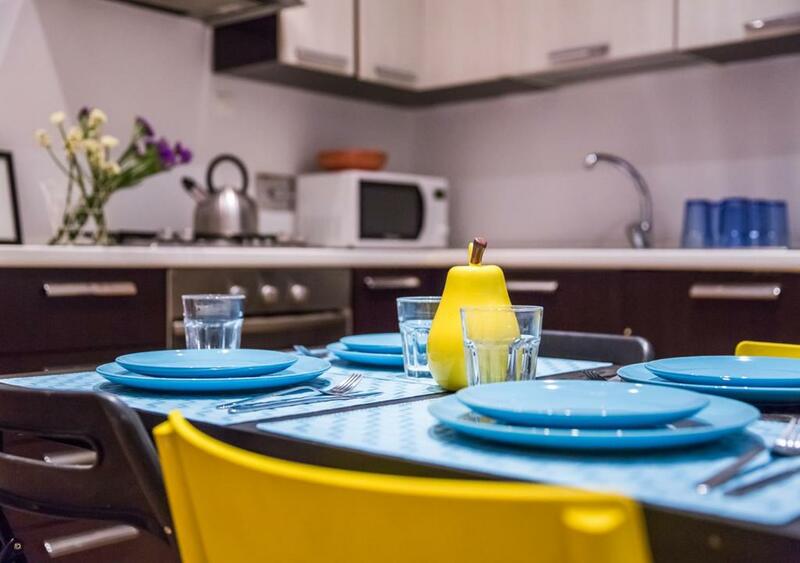 Lock in a great price for Rent In Rome House of Fountains – rated 8.1 by recent guests! 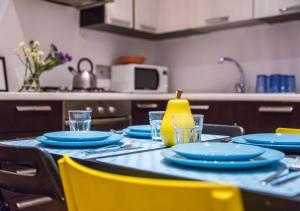 Located in Rome in the Lazio region, with Via Condotti and Trevi Fountain nearby, Rent In Rome House of Fountains provides accommodations with free WiFi. The accommodations come with a flat-screen TV and a private bathroom with bidet while the kitchen features a dishwasher, an oven and a microwave. A fridge and electric tea pot are also provided. Piazza Barberini is a 16-minute walk from the apartment. The nearest airport is Ciampino Airport, 10 miles from the property. Spagna is a great choice for travelers interested in shopping, food and city walks. This is our guests' favorite part of Rome, according to independent reviews. In this area you can shop 'til you drop for popular brands like Rolex, H&M, Zara, Nike, Cartier. 뀐 Located in the real heart of Rome, this property has an excellent location score of 9.5! 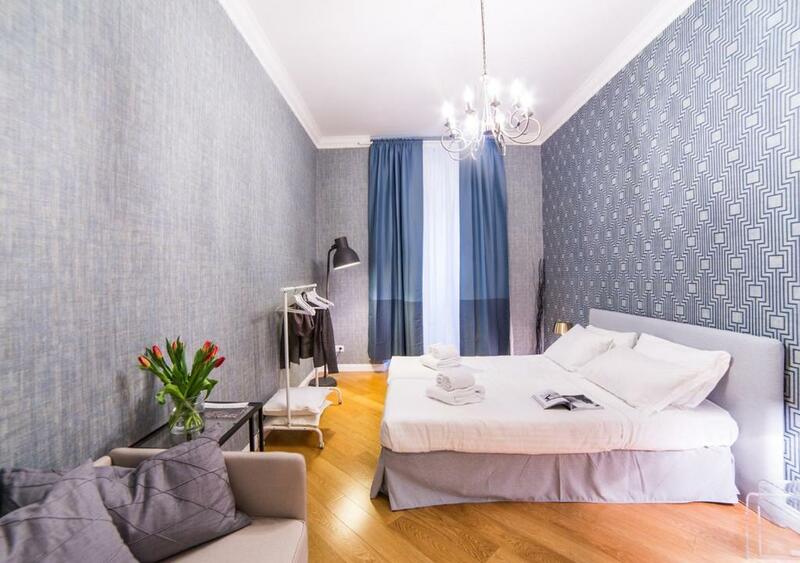 When would you like to stay at Rent In Rome House of Fountains? 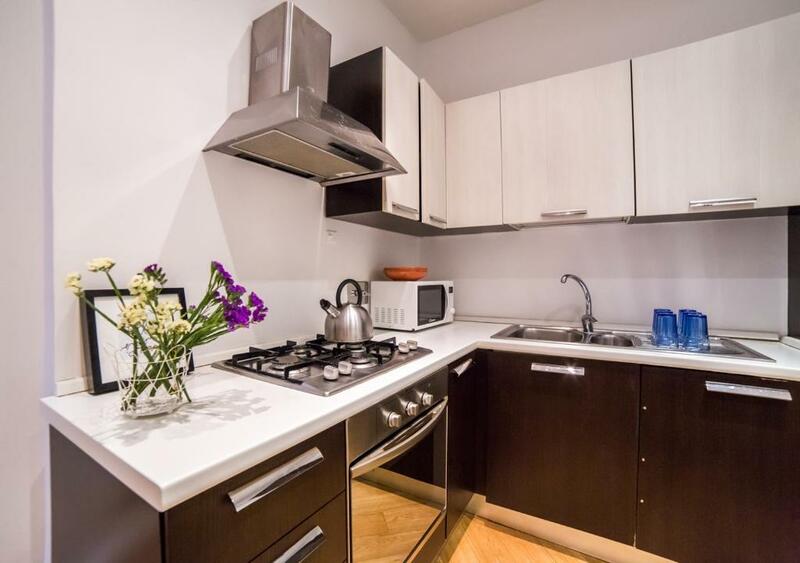 This apartment has air conditioning, kitchenware and washing machine. This apartment features a oven, sofa and dishwasher. In una traversa dell'elegante Via dei Condotti, al 4° piano di una storica palazzina questo piccolo gioiello di 40 m² apre le sue porte a chi desidera respirare l'essenza della Città Eterna . 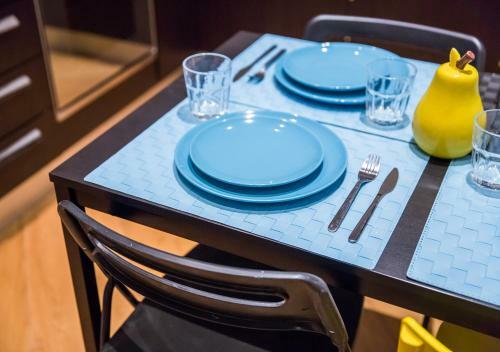 Si compone di soggiorno, con divano letto matrimoniale, cucina a vista, ripostiglio, camera matrimoniale con armadio, bagno con set asciugamani e kit cortesia. I suoi cortesi ospiti, per un massimo di 4 persone, possono inoltre disporre di un accesso Internet WiFi (gratuito), ferro ed asse da stiro, stendibiancheria, asciugacapelli, riscaldamento centralizzato, condizionatore. La cucina è completamente accessoriata con frigorifero, forno, congelatore, lavastoviglie, moka, utensili, stoviglie e posate. Si prega di notare che per preservare il pregio dell'immobile, così come molti degli edifici storici della Capitale, non vi è la presenza di un impianto ascensoristico. Hintown è una realtà specializzata nella gestione di appartamenti destinati ad accogliere viaggiatori temporanei nelle due maggiori città italiane, Milano e Roma: il progetto non si rivolge solo a chi visita la città per piacere, ma anche a chi vi trascorre un periodo più o meno lungo per motivi di lavoro o, suo malgrado, di salute. L’idea di partenza del nostro lavoro è che per conoscere davvero l’anima di una città, e quindi godere al meglio di quello che ha da offrire, occorre vederla con gli occhi di chi ci vive e ci lavora: in breve, esplorarla come un insider, uno del posto. Con questo criterio selezioniamo le nostre offerte, per proporre esperienze non convenzionali che arricchiscano il soggiorno del viaggiatore e lo facciano sentire meno “alieno” e più ospite. Area Info – This neighborhood is a great choice for travelers interested in shopping, food and city walks – Check location Excellent location – show map Guests loved walking around the neighborhood! 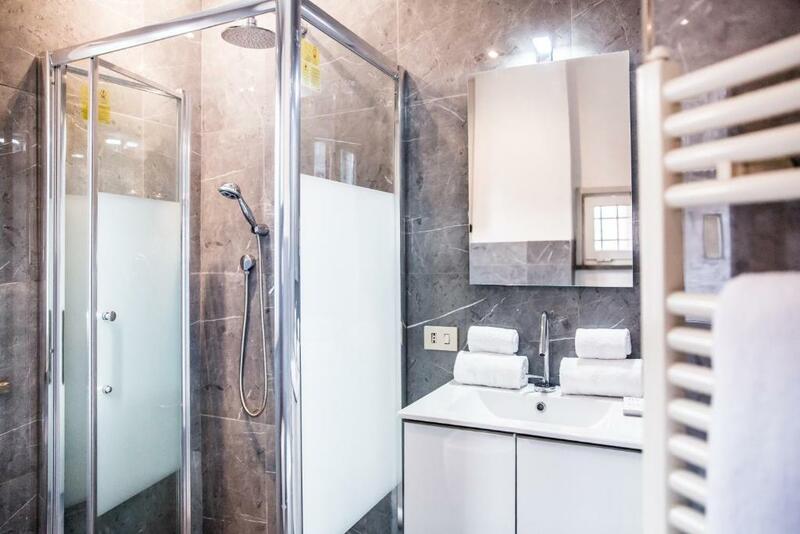 House Rules Rent In Rome House of Fountains takes special requests – add in the next step! Rent In Rome House of Fountains accepts these cards and reserves the right to temporarily hold an amount prior to arrival. Please note that the property is set in a historic building with no elevator. A surcharge of EUR 35 is applied for arrivals from 20:00 until 23:00. A surcharge of EUR 50 is applied for arrivals from 23:00 until 08:00. Arrivals on public holidays are subject to different costs. All requests for late arrival are subject to confirmation by the property. The size of the apartment does not correspond to the declared size (less than 50 sq m). The Windows of the apartment overlook the courtyard, opposite the Windows of scaffolding (repair), I hope it is not constant. We ordered a transfer, but no one came, and the organizer did not call back. We lost more than 1.5 hours waiting for the transfer. Had to get on their own. We arranged to meet at 4.00pm to collect the keys but the agent did not arrive until after 5.00pm. Room wasn't ready upon our arrival, apartment requires some basic maintenance, shower, no shower curtain, broken toilet seat, wifi didn't work in all rooms. This is an old building that has the original stairs. You have to climb 4 flights of steep stairs with your luggage. NO LIFT. Lacked a few amenities in the kitchen eg: bowls for breakfast, bottle opener and in a city that loves wine (all with corks) no way it open your bottle. The handle for the shower tap fell off. Perfect location, many restaurants and cafes close by. So close to the Spanish steps. We walked to all major attractions from the apartment. The appartment is poorly maintained. toilet cover broken, bath tub painted over and the shower curtain fell out, fridge icy. There was no wifi when they said there was and it was on the 4th floor and no one helped us with our luggage when we checked out. Very disappointing !! Too many stairs and never got a reply to my email. Lilly was nice when we checked in though !! During our stay, air conditioning and wi-fi stopped working. When we asked the owner of apartment if we can print our boarding passes they replied to us after 2 days when we were aleready at home. 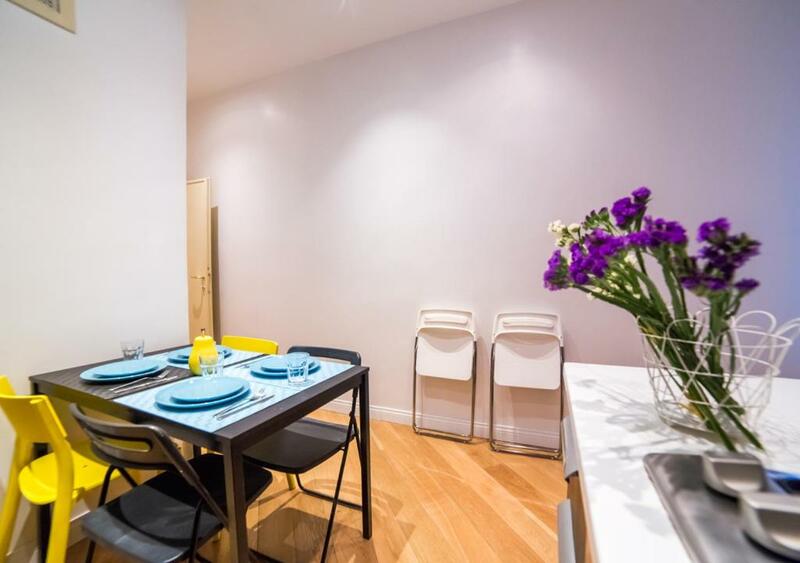 Great location, nice and clean apartment. There were no lighter for a stove, so we had to buy it ourselves. There were no cleaner for the dishes (including sponge) - in the same time guests are asked to clean the dishes before the leaving?! The apartment is situated on the 5 floor so consider it when packing the luggage. The blankets are very thin, it can be rather cold. Things that people should know * waited downstairs for more than 20 minutes with kids as no one came and got us - NOT professional * no reception downstairs * called the number given a million times no one answered to assist us * no lift as it’s an old apartment * bathroom sink was blocked unable to wash face or hands * toilet was blocked did not flush anything away * bed was unclean and had hair on it - had to put extra linen and our own towels to sleep on the pillows and bed This place should be your last resort if your only in Rome for a day or so no more than that! Even if you get what you pay for, as customers we should be able to flush our dirt away and don’t have a clogged toilet and sink and a dirty bed. As soon as I booked (before confirmation) I asked about possibility of storing luggages until afternoon on check-out day. No one answered my query. I asked again as soon as we arrived and again they didnt get back to me - until l chased them again about it. I would not have booked if I knew - our flight was at 8.00pm and at noon we were on the road with the luggage. Also 4 storeys - no lift. We were not informed of this either. The apartment has no storage space and early check in or late checkout is not always available. Check in time is 15:00, and check out time is 11:00. We arrived to the apartment at 14:00 and Marco let us have early check in, however, on the day of our departure we had an afternoon flight and new guests booked the apartment, so we had to leave by 11:00 and there was no place to store our luggage. Eventually we had to take a taxi to the Termini train station, to wait in line, and to pay extra money to store the luggage- it took us extra time and extra money. So I guess that the apartment is great if the flights are on the time of the check in and check out, however, if you need early check in or late check out, it's a problem. Another thing, the apartment is a bit old, the bathtub defiantly needs renovation.